The ship Grace Harwar lies at anchor off Wallaroo, South Australia, discharging ballast before returning to the jetty to load bagged grain. Alf Freestone, who sailed in this ship from Australia to the UK in 1929, describes the process of discharging ballast in great detail in Chapter 7 of my book, Windjammers – The Final Story. These days the dumping of ballast directly into the sea would not be allowed. I have been told of the cloudy appearance of the water off the grain ports, but now 70 years later it is quite clear. 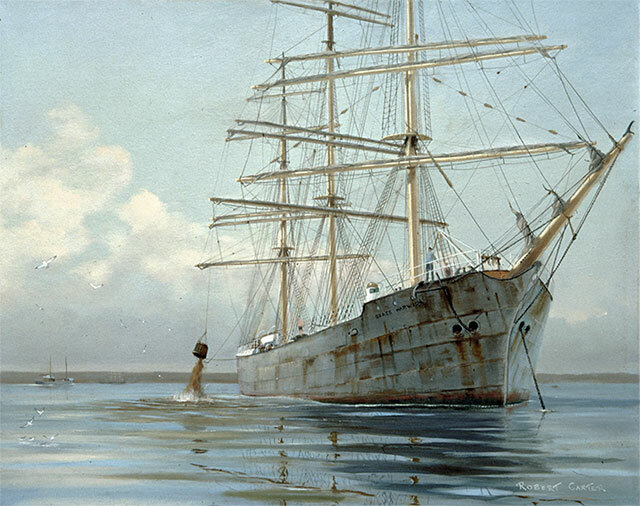 Grace Harwar was unique in the grain fleet, being the only ship-rigged vessel. 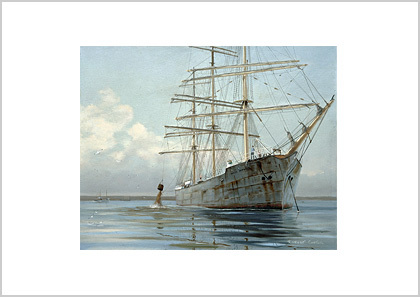 Ship-rigged vessels, built in large numbers from the mid 19th century, were superseded by the 4-masted barque which needed no more crew but due to their greater waterline length, were faster and could carry up to 30 percent more cargo. Grace Harwar was one of Gustaf Erikson’s early acquisitions (1917) and she must have earned him money as he kept her until 1935. This voyage from Wallaroo to Queenstown, Ireland was recorded on film by a noted seaman-turned-journalist of the day, Alan Villiers, who signed on as a seaman; also in his book, By Way of Cape Horn. It describes many hardships and the death of a seaman on the voyage that dragged on for 128 days. On her final voyage in 1935, when she loaded grain at Port Broughton, South Australia, for London, she made quite a good time of 98 days. She was broken up at Charlestown, Scotland. The ship Grace Harwar lies at anchor off Wallaroo, South Australia, discharging ballast before returning to the jetty to load bagged grain. Alf Freestone, who sailed in this ship from Australia to the UK in 1929, describes the process of discharging ballast in great detail in Chapter 7 of my book, Windjammers – The Final Story. These days the dumping of ballast directly into the sea would not be allowed. I have been told of the cloudy appearance of the water off the grain ports, but now 70 years later it is quite clear.